Matt Borghi - "The Phantom Light"
On The Phantom Light, Matt Borghi takes an intriguing idea and runs with it: four extended compositions inspired by sailors' tales of phantom lighthouses and will-o-the wisps of the stormy Great Lakes. Borghi's pieces are elaborate, slowly developing glaciers of sound that draw heavily on similar experiments by Steve Reich, Philip Glass, Brian Eno and Steve Roach, and while there's not much harmonic or melodic variation, both "Ile Aux Gales" and "North Manitou Island Shoal" undeniably provide deep ambiences for nocturnal listening. Dense and enveloping, Borghi's collection of multi-timbral largos resemble huge, monolithic blocks of drifting sound, like the gradual shifting of icebergs in an inland sea. As a consequence, The Phantom Light has a sameness of rhythm (or lack thereof) and tonality that probably won't appeal to all, though acolytes of the Glass/Reich/Riley school of musique statique will almost certainly appreciate Borghi's long, trance-inducing spectral symphonies. 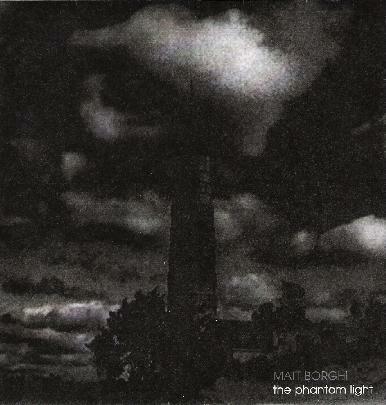 As with most ambient music constructed for specific environments and atmospheres, The Phantom Light is at its most affecting when listened to under the headphones in total isolation and, preferably, in total darkness. Expect a few altered states of consciousness and/or out-of-body experiences. For more information you can visit the Matt Borghi web site at: http://www.mattborghi.com. Visit the Slobor Media web site at: http://www.slobormedia.com.